Ikuko Furuya was born in 1961 in Nanbu-cho, at the foot of Mt. 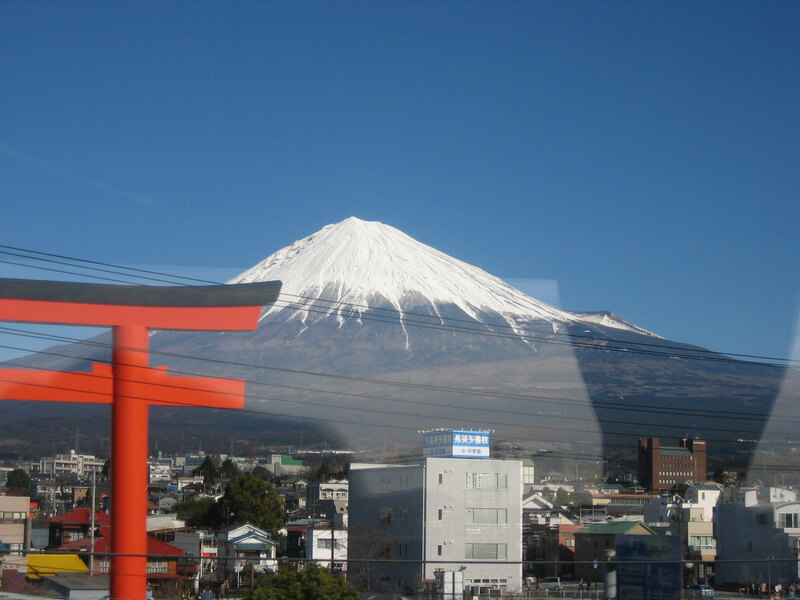 Fuji in Yamanashi Prefecture, Japan. At the age of 40 she had a divine revelation and discovered her talent in Japanese calligraphy. She started lessons with three teachers – a Chinese calligrapher, a Kamakura-based Japanese calligrapher, and a practical calligrapher. She mastered kanji calligraphy after taking private lessons from the Chinese teacher for Chinese calligraphy, which has various writing styles of Chinese characters including pictographs and seal, clerical, regular, semi-cursive and cursive scripts. Her skills and repertoire from old to modern styles of works stand unrivaled. 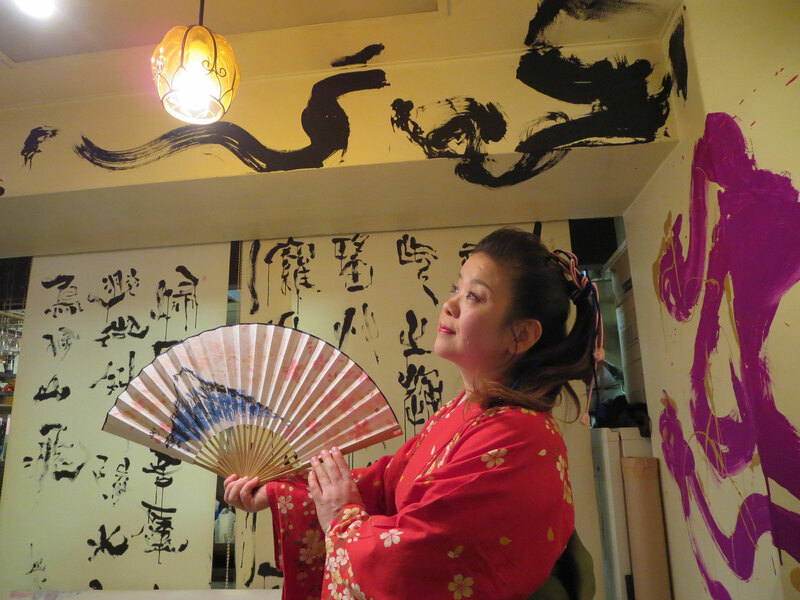 Picturesque and artistic kanji calligraphic works are her specialty. 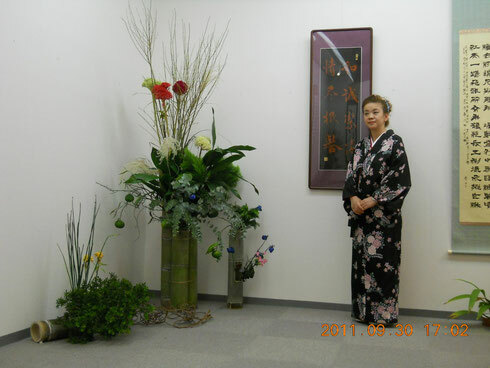 At present she is based in Shinagawa-ku, Tokyo. 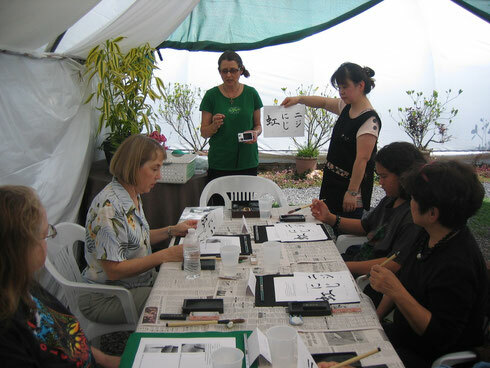 Held a demonstration of calligraphy at Naalehu Honganji church in Kau, Hawaii, U.S.A. It is said that Japanese calligraphy is difficult to appreciate for those outside Japan. In order to promote greater understanding of “Japanese calligraphy” as well as of Japanese culture, we plan to hold our Calligraphy Association of Pacific Rim’s exhibition and workshop at the World Budo Centre in Poland. Japanese calligraphy has a long history. It was established after Chinese calligraphy was introduced to Japan about 1,600 years ago. Ikky, skilled at writing many kinds of scripts or writing styles from pictographs to seal, clerical, regular, semi-cursive and cursive scripts and Sanskrit characters, expresses a part of literary works with her style of calligraphy by commanding hiragana, katakana, kanji and alphabetical characters. She has created a new style of contemporary artistic calligraphy, which is an extreme fusion of modern design and traditional art. Works in her style are characterized by high quality and accordance with modern environments, creating a comfortable atmosphere in a living space. As one of the pioneers introducing a new field of “calligraphic brush art”, Ikky has established a stellar reputation. When Ikuko creates a work inspired by literature, she renders a vivid portrayal of the world through her full comprehension of the lifestyle, thought, philosophy and background of the author. She is said to be a master of relating the world of literature to calligraphy. Her art provides waves of chi energy, making people feel comforted and moved. The person who works on “calligraphic brush art” is like a performing musician playing the live music in her/his own interpretation from an original song. In artistic calligraphy, characters are richly expressed through writing styles and spacing, the finished calligraphy radiant, giving you both life and healing energies. 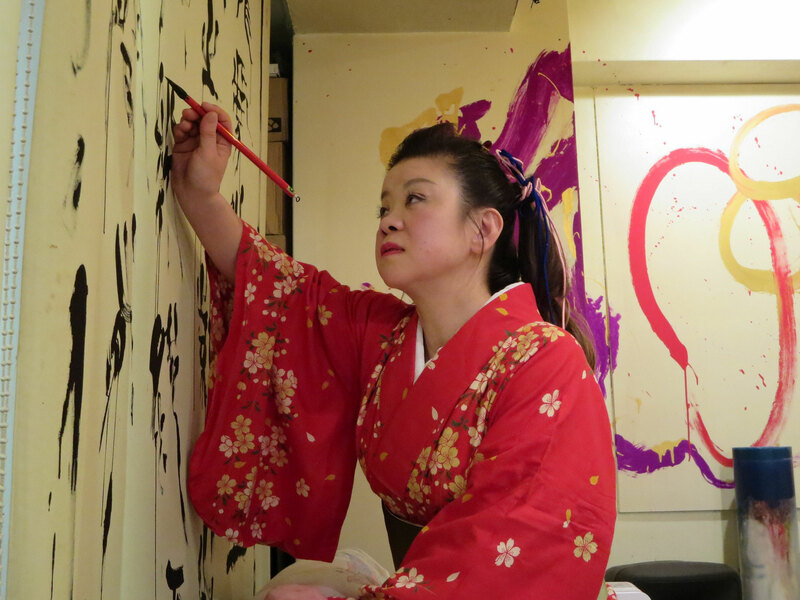 Ikky feels that her role is to move people by expressing eternal soul in calligraphy, and she is passionate about teaching young people and continuing the future of the art. In Japan students learn Japanese calligraphy in a traditional method at independent calligraphy institutes scattered throughout Japan in addition to their primary educational programs. Schools or institutes are belong to feudalistic calligraphy organizations and it is common for students learn how to make their work look same the way the teacher shows as an sample, that means no specific individual character is required. Even if their work done looks very good it will not be appreciated. It has to be approved by teachers’ method where students are belongs to. 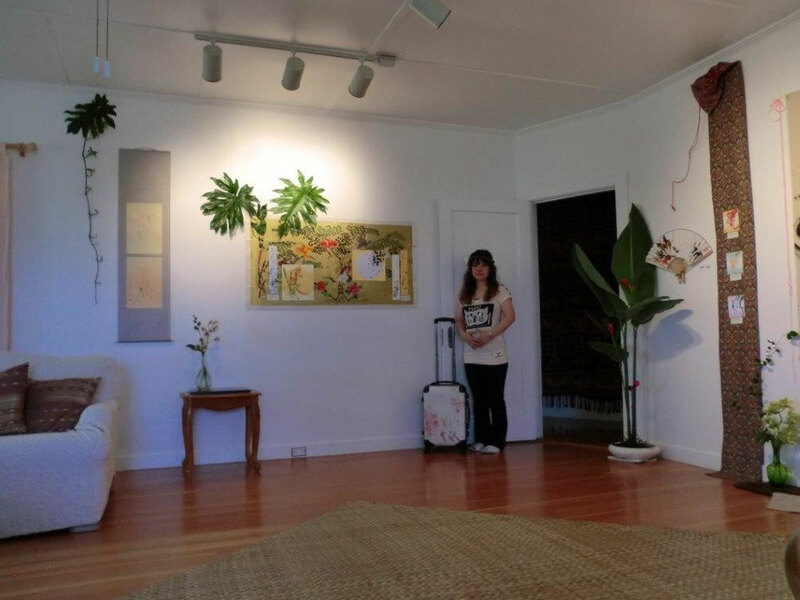 For Ikuko Furuya it has been a question and it was hard to understand this kind of traditional environment. If there’s no character it could be just a copy of work. It is said that originally, Kanji-letter had been created by drawing pictures. 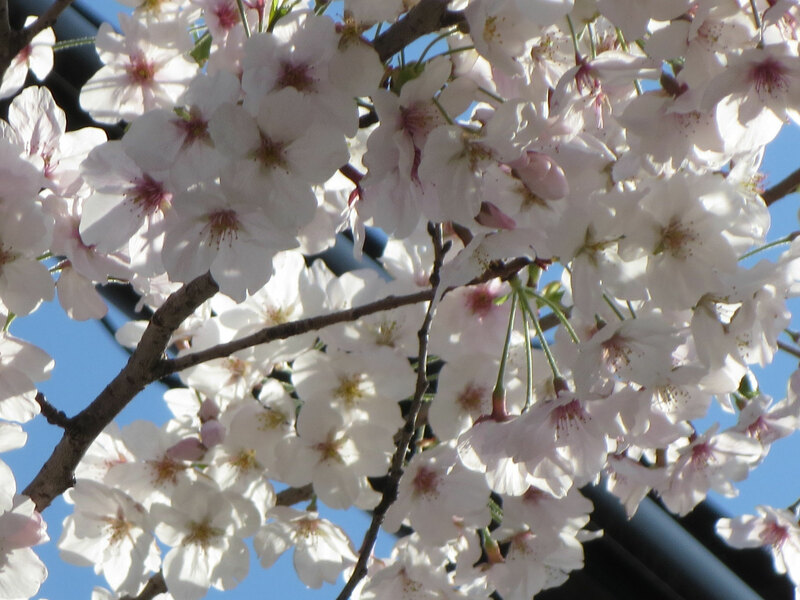 She believes that in ancient days people had started creating Kanji-letter to pray and worship god delivering their inner spirit genuinely. After years of her calligraphy study Ikuko Furuya has determined to be independent and started creating her own calligraphy works genuinely and faithfully to what god tells her. 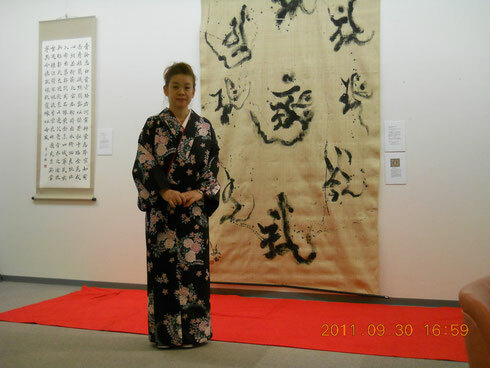 She will continue working to the future but keeping good traditional spirit of Japanese calligraphy. Ikuko Furuya travels more globally to deliver wonderful world of Japanese Calligraphy in her method. She would demonstrate her works and hosts exhibition but she is most interested in teaching young children wherever chances are. 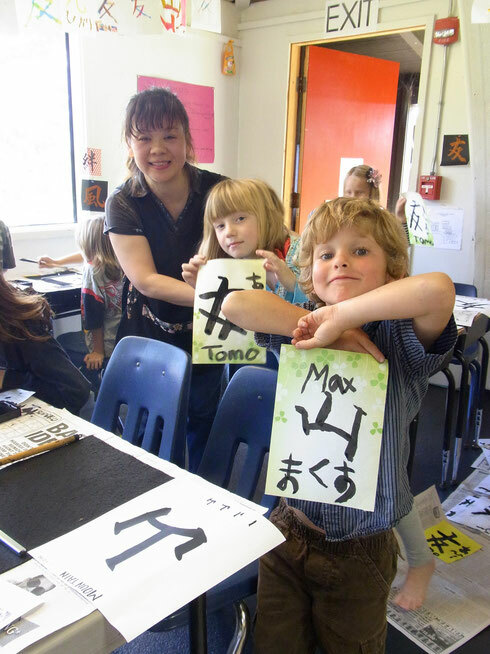 She believes Japanese calligraphy lesson provides them concentration, harmony and silence and of course, they enjoy their own master piece of work! She has done kids’ lesson not only in Japan, but China, Philippine and Hawaii, etc.